We all know how frustrating it can be to bring a lovely potted houseplant into the home and then find yourself fighting houseplant pests. The last think you want to do is spend your time fighting those bugs all winter long. Once the season changes and winter approaches, houseplants go dormant. This will make them more prone to pest attacks. The best way to approach this issue is to follow a few easy steps which can help your potted houseplants and control this pest issue. Keep your containers and potting mix clean and sterile. If you are using a pot that has already been used then run it thru the dishwasher. And, never recycle potting soil from another plant. Always start with new potting mix. Check the plants when you purchase them and make sure they aren't already infested. If you find any then wash them with a mild soap and water. If you find that later after planted you potted houseplant, it gets bugs then move it away from your other plants so it doesn't affect them also. Don't let the plants get dusty or cobwebs. These things will attract spider mites. Use a damp paper towel or soft cloth to wipe the leaves off on a regular basis. So as you can see it's not as tragic as you may think. 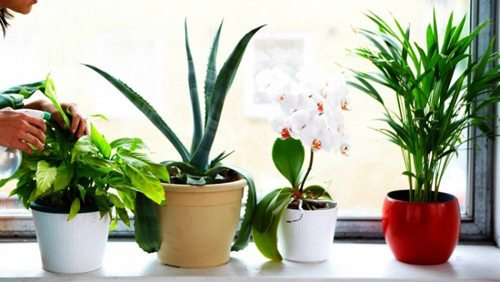 And please don't just toss the poor houseplant out without trying these steps. It's a situation that nobody wants but one that can easily be dealt with. Read more..... Let's repot a succulent. Read more..... Super Shrubs for Containers.